September 27, 2013 September 27, 2013 ~ Bernie K.
It is at best uncertain whether you or anyone else currently in your condition will benefit from your participation in a clinical trial. If the trial is successful — and as we have mentioned earlier not all of them are — and the drug or appliance is cleared for marketing, some of those who get a similar condition in the future may benefit from it. Your participation is your legacy to them. But the important question is, “Who benefits now?” That is particularly relevant since large amounts of time, effort and money go into clinical trials. Someone must believe the investment is worthwhile. Let’s take a look at each of the stakeholders. The doctors and other practitioners involved. The organizations and institutions they are a part of and represent– the Medical Centers, Hospitals, Universities and PhysicianFirms. The pharmaceutical and medical equipment companies whose products are being tested and who sponsor the trial whose self-interest is definitely connected to the success of the project. The principal investigators — a.k.a., the lead doctors — have their reputation on the line. The study is based on their hypothesis. If the clinical trial turns out favorably, they can say, “See I was right!“ Not only is that a boost to their ego, it enhances their reputation and all that goes along with it. If successful, they get to publish the results and present the findings at national meetings. Moreover, it enables them to test out their ideas, to get funds for their projects and it increases their income as well. Those personal benefits contribute to their wanting you to participate and, perhaps, inadvertently encourage you to do so. That is particularly true when the number of possible candidates for the clinical trial is limited, and the lack of participants threatens the validity of the results or even makes it impossible to conduct the trial. In fact, the possibility of being pressured to enroll has led to the requirement that in order to participate in a clinical trial you must sign a form indicating that you are giving your informed consent. The medical centers, hospitals and academic institutions associated with the clinical trial benefit as well. It can be an important source of revenue. Running clinical trials has become a business. Apparently a very profitable one. If you don’t believe it, go to Google and type in “clinical trials” to see how many local institutions come up trying to get you to participate. Or just watch TV. WakeMed solicited participants for a fibromyalgia clinical trial. Another ad suggested you check out a website. When I did what came up is the website for PMG Research. That company promotes your participation as a clinical trial volunteer at one of their numerous locations. The website is a promotional piece designed to get you to enter one of their trials, telling you all the advantages. 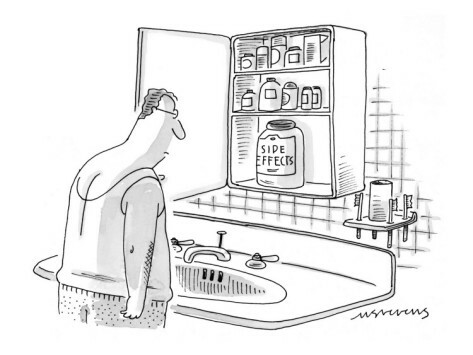 The website doesn’t say much about the possible “side effects” or the real and financial costs involved. Nor does it say who is sponsoring PMG and financing its operations. They are recruiting participants for clinical trials and trying to get you to be one. The driving force behind all this activity are the pharmaceutical and medical equipment companies. When the trials are successful, they get additional revenue and profits from the sale of the newly approved drug or medical device. To put it mildly, those profits can be substantial. They are so substantial, in fact, that some firms have gone so far as to manipulate the clinical trial and engage in other practices — like promoting off-label use, attempting to extend the period of patent protection, and lobbying for and getting legislation passed. All those activities enhance their revenue and profits. When clinical trials are conducted in an open, transparent and above-board fashion, the results can provide important information about new therapeutic options, including data about its likely favorable and unfavorable outcomes. While the information can be useful for those who have a similar condition in the future, often that improved understanding is of little help to the participants in the trial. Moreover, if the trial is manipulated or if the published and publicized results do not accurately reflect the likely outcomes, they are of little help in arriving at the appropriate therapy. Furthermore, the test results are only relevant when the patient’s condition matches that of the participants in the clinical trial. The possibility of a favorable net benefit, as unlikely as it is, leads some patients in desperation to say, “Yes, what do I have to lose?” The answer to that question is that the losses can be considerable. Remember, you are allowing yourself to become a guinea pig. There are another set of potential stakeholders. If the outcome of the clinical trial reveals that the drug under consideration has significant net benefits, then current and future individuals with the same disease are among the potential beneficiaries. In our next post we will take a look at some examples of the consequences of participating in a clinical trial. It is based on Amanda Bennett’s The Cost of Hope. She is a fine journalist and currently Executive Editor of Projects and Investigations at Bloomberg News. The book documents her husband, Terence Foley’s, seven year bout with kidney cancer.